There is no question Ovechkin has a much more decorated career. He has more career goals (341) than Kessel has points (333), and has as many Hart trophies (two) as Kessel has All-Star game appearances. But the disparity between the two players is a product of Ovechkin's early-career dominance, something that hasn't been apparent in his game for a few years. 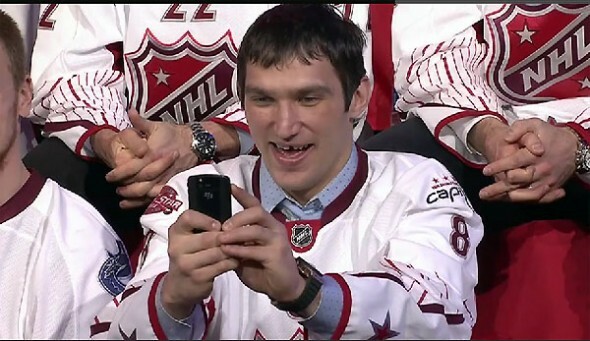 In fact, Ovechkin looks like a shell of his former self. Since the 2011 All-Star Game, when Ovechkin took a little too much delight in Kessel's last overall selection, Kessel has 118 points (50 goals) in 125 games; Ovechkin has 104 points (53 goals) in 116 games. The career trend doesn't favour Ovechkin either; his yearly points total has declined each year since 2007-08, bottoming out at 65 last season, and he hasn't broken 40 goals since 2009-10, although he narrowly missed last season, scoring 38. But despite a rapid decline, Ovechkin is still a fearsome goal-scorer. He has netted 72 the last two years, the sixth highest total in the NHL. And in reality, he has had only one "bad" year, that being last season, and he still almost hit 40 goals and ended up with over 60 points. That's really good for someone's worst season. But because of his contract, being a fearsome goal-scorer isn't enough; Ovechkin needs to be one of the absolute best players in the NHL to justify his burdensome salary. Ovechkin has eight years remaining on a contract that pays him over $9.5 million a season, which is easily the largest cap hit in the entire league. It made sense to give Ovechkin that type of money when he was scoring 50+ goals a season and regularly breaking 100 points, but he's no longer the dominant player of yesteryear. And at 27, it's likely the best days are behind him. Wingers routinely peak in their mid-20s, and while they don't begin to decline until their late-20s, early-30s, it's not likely Ovechkin will get close to 60 goals again. In comparison, Kessel is almost two years younger than Ovechkin and has a much more team-friendly contract at $5.4 million a season. The problem is that Kessel becomes an unrestricted free agent after next season and is in line for a pay raise (perhaps in the $7-8 million range). That raise will still be lower than Ovechkin's cap hit, however, and the term on the open market can only be a maximum of seven years (eight if he re-signs with Toronto), meaning both deals would end after the 2020-21 season. The crucial difference is that Kessel's deal would finish after his 33-year-old season, whereas Ovechkin's finishes after his 35-year-old season. Essentially, the difference between the two contracts would be two extra prime years for Kessel and two extra decline years for Ovechkin. Therefore, unless Kessel's 82-point season was an outlier rather than the beginning of things to come, it is more likely that Kessel, not Ovechkin, maintains a high level of production and would do so for less money over the course of his next contract. Even the normal knock against Kessel—he is a one-dimensional player who couldn't find the defensive zone if Randy Carlyle drew him a map—isn't a major failing compared to Ovechkin. The Russian winger has heard the same criticisms lobbied against himself, which may be one of the reasons why he recently lent an encouraging word to Kessel. In addition, Ovechkin has been labelled a coach-killer, with the ouster of Bruce Boudreau and Dale Hunter being the prime examples (and you might have to add Adam Oates to that list if the Capitals don't turn their season around). Both players have started slowly this season. Ovechkin only has five points in 10 games (two goals) and Kessel has no goals and six assists in 10 games. But that doesn't mean they have lost the ability to score. Both are among the league leaders in shots on net, so they are still generating chances, which is why we shouldn't worry too much about their early slumps. If the two snipers can score at their career average rate from here on out, both should end the season with at least 17 goals (which would equate to a 30-goal season over a normal 82-game schedule). The main difference between the two players at this point in their careers is physicality. Ovechkin is routinely among the league leaders in hits, whereas Kessel might fluke his way into 10 hits a year, most likely because the scorekeeper mistook him for someone else. This adds an extra element to Ovechkin's game, but could also make him more susceptible to injuries as he ages. However, Ovechkin has shown a remarkable ability to avoid the injury bug so far in his career, playing in at least 78 games every season. Kessel hasn't been able to suit up for quite as many games, but has still played in at least 70 games every season. A few years ago there would be no debate between Kessel and Ovechkin. The clear answer was Ovechkin. But now, with the Great 8's declining stats and large contract, the choice is not so clear. So what do you think? Starting today, would you rather have Ovechkin or Kessel on your team? Feel free to debate your choice in the comments section. Hard to say. Ovechkin's contract is kinda nuts but I can't shake the feeling he still has some elite hockey left in him and we'll all laugh at the days we thought he was done. Ovechkin. Provided I don't have to stupidly play him with Joey Crabb and Jay Beagle. Kessel's contract is almost up as well and that's a plus. Kessel looks like he is trying, Ovie not so much. So I will have to go with Phil.